Download The Choice in Digital HD from the iTunes store. The Choice images are © Lionsgate. All Rights Reserved. Never judge a book by its cover. Or in this case, never judge a movie by its trailer. 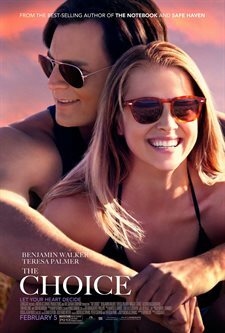 Nicholas Sparks' latest feature film, The Choice, looked less than appealing based on the two minutes I saw online. The story held no interest for me and the main characters had no chemistry, or so it seemed. To be honest, I seriously thought about not going to see it because it just looked bad. I couldn't have been more wrong. Granted, The Choice won't be winning any Oscars, but in terms of a decent movie with that typical Sparks flair for telling a love story and making us cry, it hits its mark. Travis (Benjamin Walker; In the Heart of The Sea) is that late twenties/early thirties guy who doesn't plan to settle down and can charm the pants off of any woman in a twenty five mile radius by simply smiling at them. Well, almost any woman. Gabby (Teresa Palmer; Point Break) is the cute little medical student who rents the cottage next to Travis and is seemingly immune to his charms. Or so she would like to believe. As Travis likes telling Gabby, she bothers him and frankly he bothers her too. A fact she is unwilling to admit until he is able to thaw her icy exterior. Unfortunately (or maybe fortunately) for Travis, Gabby gets under his skin and affects him as no woman has before. And that is when the chemistry gets good. These two explode into a volcano of sexual tension and emotion that leaves the audience (at least the female members) breathless. Walker and Palmer actually have more chemistry than the trailer lets on and Walker will clearly win tons of new female fans after they see how he oozes charm in this film. Director Ross Katz (Taking Chance) does a fine job, though I found his constant use of extreme close ups a little annoying and I felt a couple of scenes dragged on longer than necessary. I also found the resemblance between Travis' sister Stephanie (Maggie Grace; Lost) and his lover Megan (Alexandra Daddario; San Andreas) too similar and at times got confused as to which woman was in which scene with him. As far as Sparks' films go, this was a fairly good one and, like I said, a bit of a pleasant surprise. It has all the elements of classic romance including the melt your heart, male grand gesture and declaration of love, and the tragic incident that has you weeping into your popcorn. The Carolina scenery also helps set the mood of endearing and enduring love. I have no doubts there will be groups of single women who will plan a Girls night out this weekend to combat the Valentine's Day blues (A.K.A "Singles Awareness Day – S.A.D) and I can certainly recommend this film as a good option. It has the romance, the heartbreak and a few fine looking gentlemen to swoon over. The Choice is another solid delivery from the ever churning Nicholas Sparks wheel.